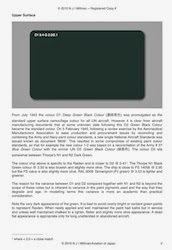 The colour value derived from an original swatch prepared by Mr Noboru Shimoune to illustrate the Ki-43 III Ko upper surface colour is Munsell 7.5 Y 3/1.5. The closest FS value to this is 33070 @ 2.49, which is just a little lighter. The RAL colour 6014 Gelboliv (Yellow olive) is slightly closer @ 2.36, but is a little darker. 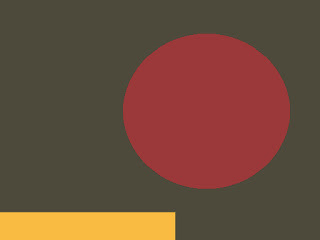 The colour is within the range for the JAAF Standard Ohryoku 7 go shoku which became colour standard 1-1 in the joint Army-Navy document 8609 of February 1945. 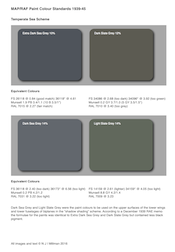 This top surface olive-drab colour was also associated with the Ki-54, Ki-74 and Ki-94. The swatch for the propeller colour is Munsell 5 GY 3.5/2.3 and the closest FS value is 34092 @ 2.14, which is just a little greener and not quite grey enough. Previously this colour was visually matched to FS 24172 for a 1/72nd scale model, but that is a lighter shade (the DE2000 difference calculation between 34092 and 24172 being 10.2). The under surface colour was visually matched to FS 36405 from a piece of extant stabilisor taken from a 64th Sentai Ki-43 III Ko in Malaya. This is a creamy "stone" colour, the closest Munsell value to which is 5 Y 7/2 @ 2.16. The top surface of this piece was visually matched to FS 34088. Mixing the upper surface colour 34088 with white results in an almost exactly similar colour to 36405. 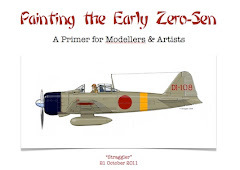 From Mr Shimoune's article I understand the interior colour to have been the same as the top surface olive drab, which was in accordance with the Army Aircraft painting regulations (Rikugun kokuki tosou kitei) of 15th June 1943. However, Mr Kenichi Oshimo, the chief designer for the Ki-43 III recalled that the interior was painted with green or grey-green paints similar in appearance to FS 34128 and 34159 respectively. In the colour photograph the rear decking area under the canopy does not appear to be black but rather a dull olive green or olive drab colour. 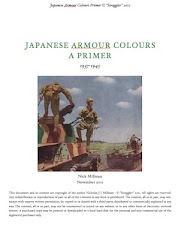 "Nohryoku- shoku" as referred to in Mr Shimoune's article relates to IJA Green (Mr Color #16), Dark Green (Nakajima) (Mr Color #129) or Dark Green (Kawasaki) (Mr Color #130). The first kanji "noh" may be translated as "strong" or "dense" so "deep green" may be a suitable description. "Anryoku-shoku" as referred to in the article relates to IJN Green (Mr Color #15) or Dark Green (Mitsubishi) (Mr Color #124). The first kanji "an" may be translated as "dark" so "dark green" may be a suitable description. The two colours in the original JAAF standards that also use these descriptions are #22 'Noh Ryoku Shoku' and #26 'An Ryoku Shoku', but unfortunately the precise nature of the appearance of these colours is not known. Very special thanks to Isamu Marahashi for kindly clarifying these colour descriptions. Thanks for this update on Ki.43-III colors.